The Sustainable Agriculture Farming Systems (SAFS) project was established in 1988 at the University of California, Davis to study alternative agricultural systems and determine how these systems are relevant in both site-specific and regional contexts, using an interdisciplinary approach. The first phase of the SAFS project, completed in 2000, focused on agronomic differences between conventional, low-input, organic systems. During the first 12 years, SAFS established itself as a leader in agroecosystem research and education projects that quantify and analyze complex ecological and economic consequences of the transition from conventional to non-conventional farming systems. These efforts generated a wealth of peer reviewed articles, informational newsletters, and outreach materials. 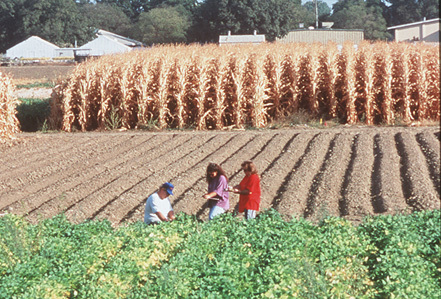 In 2002, SAFS began a second phase to examine the interaction of tillage effects on the three historical systems, and explore the broader effects on off-farm environmental quality. Now located at a joint research site with the Long Term Research on Agricultural Systems (LTRAS) project, SAFS continues to advance research on the sustainability and environmental impacts of large-scale agricultural practices in California. SAFS will soon be part of the University of California ANR/UC Davis campus joint Agricultural Sustainability Institute (ASI). SAFS was originally funded by the University of California Sustainable Agriculture Research and Education Program (UC SAREP), the USDA’s Western Region Sustainable Agriculture Research and Education (SARE) program, the California Department of Food and Agriculture’s (CDFA) Department of Pesticide Regulation (DPR), and CDFA’s Fertilizer Research Education Program (FREP). Current funders include the California Bay Delta Authority (CBDA), the Kearney Foundation of Soil Science, CDFA, Unilever, the California State Water Resources Control Board, and the UC Davis College of Agricultural and Environmental Sciences. Below is the description of the SAFS project prior to 2002. Steadily growing public concerns about pesticides, food safety, environmental quality, groundwater contamination, dependency on finite supplies of fossil fuels and soil and water conservation have led many growers and researchers to consider alternative means of agricultural production. New research in this area is generally labeled "sustainable agriculture." Practices commonly associated with sustainable management include reduced use of chemicals and fossil fuels, maximum use of on-farm inputs, crop nutrient recycling, and increased use of diversified crop rotations that enhance soil cover and fertility. The abundance and diversity of weed, pathogen, arthropod and nematode populations. Differences in soil biology, physical and chemical properties and water relations. Crop growth, yield and quality. The secondary objective of the project is to evaluate known and novel farming practices that show potential to reduce dependence on nonrenewable resources. The final objective is to distribute information generated by the project in an effort to facilitate a dialog about the adoption of more sustainable farming practices. This is accomplished through workshops, field days, publications, field tours, and other educational mediums, including the world wide web, SAFS Project video, and multiple slide shows. Although some features of this research are similar to work already reported or in progress in other parts of the United States and internationally, several aspects of the SAFS project make this effort unique: the combination of a Mediterranean climate; a relatively long (4-year, five crop) rotation with three complete rotation cycles over a total of twelve years; management of each system using best farmer practices; and foremost the degree to which farmers and farm advisors have become involved in planning, execution, and interpreting all disciplinary facets of the project. The study attempts to combine the best features of both on-farm and experiment station research; it is established under controlled conditions on a research farm, yet employs commercial farming practices that must be economically justifiable and that are regularly evaluated by farmer cooperators. Three farmers (two organic and one conventional) and two University of California Cooperative Extension farm advisors participate in all decisions on the project. Nine disciplines currently are represented: agronomy, agricultural economics, entomology, water science, nematology, plant pathology, soil microbiology, crop nutrition, and weed science. The four SAFS treatments include four-year rotations under conventional (conv-4), low-input, and organic management and a conventionally-managed, two-year rotation (conv-2). All three, four-year rotations include processing tomato, safflower, bean, and corn. In the conv-4 treatment, beans are double cropped with winter wheat, while in the low-input and organic treatments, beans follow a mixture of oats, vetch, and pea. Cover crops are grown during the winter preceding all other cash crops in the low-input and organic systems. The conv-2 system is a tomato wheat rotation. There are four replications of each treatment and all possible crop rotation entry points are represented within each farming system replicate, resulting in total of 56 plots. The plots measure 68m by 18m (0.12 ha) each and are arranged in a randomized block, split-plot design. The economic analysis of the four systems and their respective crops is pivotal to the interpretation of project results. The economic performance of each cropping system and farming system is quantified using the Budget Planner computer program. It is used to generate costs, returns, and profits and simulate the economic performance of a hypothetical 810-ha (2000 acre) farm. The actual costs of material inputs and labor are based upon current prices within the region. American Society of Agricultural Engineers (ASAE) formulas are used to calculate equipment costs for fuel, lubrication, and repair. The economics of field operations are derived from costs for labor, materials, and equipment; and field operation time is based on the use of commercial-sized equipment. This approach produces realistic budgets by accounting for the disproportionately large amount of time needed to manage small, experimental plots. All crop yields for the calculations are based upon experimental treatment means. So far, the most promising innovation evaluated at the SAFS site include the superior agronomic and economic performance of the low-input corn system and the development of practices to optimize N management in cover crop driven systems. In addition to the 20 acres occupied by crops in the main experiment, an 8-acre companion area contains larger (1.2 acre) blocks planted to the same five crops and managed like the low-input system. Better cover crop options, as well as improved practices for weed management, tillage and crop nutrition, are evaluated at the companion site by project researchers with a broad array of disciplinary interests. Because N deficiency has been an occasional problem in the organic system, we are studying the effects of crop management strategies and soil faunal abundance and activity on N release to better understand soil N processes in organically-managed systems. An experiment in the companion area is being used to test the effect of late-summer/fall cultural and cropping practices on levels of bacterial-feeding nematodes in the spring, and to determine the effect of those practices on N availability to transplanted tomatoes. Results show that summer cover crops and fall irrigations promote bacterial-feeding nematode abundance and N mineralization which leads to higher tomato yields. Earlier cover crop establishment in the fall with the aid of irrigation has now been adopted in the SAFS organic and low-input systems in order to get greater cover crop growth, N fixation, and N mineralization the following year. Variable C:N ratios and N levels of organic inputs, such as vetch and compost, pose a challenge to growers and make determination of N sufficiency difficult. Companion area studies have shown that conventional petiole nitrate testing is not a good predictor of yield potential, but that total early season plant N may be a useful indicator. These studies also suggest that five or more years of consistent organic inputs can substantially increase the ability of the soil to supply N to plants. Potentially-mineralizable N in soil may also be a useful early-season tool for gauging the fertility status of the soil managed with organic inputs. The feasibility of reduced- and no-tillage methods of tomato production is also being evaluated in the SAFS companion area. No-tillage agriculture has not taken hold in California for a variety of reasons, including the widespread use of furrow irrigation, water requirements for cover crop production, different bed widths for different crops in rotation, as well as perceived or real pest problems. SAFS researchers are now developing a reduced-tillage tomato system which uses non-chemical or reduced-chemical cover crop management, transplanting, and cultivation under high-residue conditions. This project is entering it's second season. Weed management currently accounts for nearly 25% of tomato production operating costs in all SAFS farming systems. However, in absolute costs, weed management has usually been more expensive in the low-input and organic systems due to greater reliance on hand hoeing. In 1997, the use of a single, pre-transplant herbicide application in the low-input system greatly improved the economic performance of that system. But, non-chemical alternatives are needed as well. Two possibilities have been evaluated at the SAFS project: flaming and weeder geese. Flaming may be compatible with conventional, low-input, as well as organic systems but is no less dependent on fossil fuel that herbicides. By contrast, the use of weeder geese is a biological weed management approach which may be appropriate for organic operations and reduce hand hoeing costs. Geese may be especially effective at reducing grass growth in the tomato rows. Preliminary studies indicate that both of these methods may have some potential and research this season will be aimed at refining weeder geese use and assessing its costs. Widespread adoption of low-input and organic farming practices depends upon the development of cost-effective alternatives to agrochemical-based inputs. Research findings demonstrate some of the benefits and trade-offs to be expected from low-input and organic management. Agronomic and economic evaluations of pest management systems have shown dramatically different potentials for pesticide reduction among field crops. In conventionally-managed processing tomatoes, synthetic herbicides (including trifluralin, glyphosate, napropamide) and insecticides (including dimethoate, carbaryl, diazinon, and esfenvalerate) are used regularly. Sulfur is also commonly used as a miticide but fungicides and nematicides are rarely used. Research findings from the first 9 years of the SAFS project indicate that reductions in insecticide use are possible when scouting and thresholds are used. But reductions in total pesticide use, while possible, are economically costly due to the lack of cost-effective and reliable nonchemical weed management tactics. Weed management currently accounts for nearly one-third of tomato production operating costs in all SAFS treatments. However, in absolute costs, weed management has usually been more expensive in the low-input and organic systems due to greater reliance on hand hoeing. Although total pesticide use could be reduced by 50%, premium prices are needed to compensate growers for increased pest management costs which may average 50% more than conventional pest management costs. By contrast, pesticide use in corn, bean, and safflower grown in a four-year rotation could be reduced by 50% or more with little or no reduction in yield or increase in cost. Soil quality research to date at the SAFS site demonstrates that an array of changes in chemical, biological, and physical soil properties result from the transition to low-input and organic farming practices in California's Sacramento Valley. Many of the changes observed were expected while other findings provided new and interesting insights into soil processes. In general, changes resulting from low-input and organic farming methods have had postive, long-term effects on soil quality, including increased storage of plant nutrients and C, greater biological activity, and improved water infiltration. However, other changes present new management challenges, such as the slow or unpredictable N mineralization processes in systems depending on cover crops and/or organic amendments for N fertility. Current and future research at the site is aimed at addressing N availability problems in organic and low-input systems by finding means of monitoring and managing the soil biota. In addition, future work will continue to examine the interactions between soil processes such as the effects of bacterial-feeding nematode population dynamics on N mineralization and the effects of the microbial community on soil aggregration processes. Perhaps the greatest benefit of studying soil quality is gaining a greater understanding of the interrelationships between various soil functions. Whole-farm profit comparisons demonstrate the economic incentive for a 2-year rotation with tomato; a common cropping strategy in the Sacramento Valley. The primary concerns about this system are the potential for increased disease pressure and/or degradation of soil structure. Current research at the SAFS site is focusing on evaluating these problems and their associated costs. Among the 4-year rotations in the SAFS study, the organic system with premium prices was the most profitable. Thus, it is a potentially viable farming system option for the Sacramento Valley with the current market demand for organic products. However, this system's dependence on price premiums leads to some concern over its long-term economic viability as more growers transition to organic methods. Yield comparisons indicate that the transition to organic production may be somewhat problematic for crops with high N demands, such as tomato and corn. However, bean appears to be a reliable and profitable crop during the transition. The conv-4 farming system generally had the lowest costs but ranked third in profitability. The low-input system performed well agronomically but had relatively high costs. Among the low-input cropping systems, corn demonstrated clear agronomic and economic advantages over conventional production methods. Furthermore, environmental advantages may accrue from increased adoption of this cropping system throughout the region. Since 1992, when composted manure applications in the low-input corn system were replaced with supplemental inorganic nitrogen fertilizer, applied at about one-half the rate of the conv-4 system, yields have been consistently greater even though synthetic fertilizer N use has been 70-125 lbs/acre while that in the conv-4 corn system has been 160-200 lbs/acre. Cover crop residues have prevented the water infiltration problems observed under conventional management. Furthermore, the substitution of cultivation for some herbicide applications has reduced herbicide use and total pest management costs by 50%. Because N deficiency has been an occasional problem in the organic system, we are studying the effects of crop management strategies and soil faunal abundance and activity on N release to better understand soil nitrogen processes in organically-managed systems. We have established an experiment in the companion area to test the effect of late-summer/fall cultural and cropping practices on levels of bacterial-feeding nematodes in the spring, and to determine the effect of those practices on N availability to transplanted tomatoes. Results show that summer cover crops and fall irrigations promote bacterial-feeding nematode abundance and N mineralization which leads to higher tomato yields. These nematodes may be a marker/indicator of soil biological activity in general and future research will be expanded to include other organisms in the soil food web. To further elucidate N processes at SAFS, stable isotope research was started to monitor and quantify the fate of N from crop residue to determine how much of this becomes available to the following cash crop. Two practical findings based on experiences at the SAFS project include the use of grass/legume cover crop mixtures to accommodate a range of soil fertility conditions and cover crop rotations to prevent the build-up of disease. Grasses will respond to high mineral N condition with vigorous growth, taking up this available N so that it can be conserved in the system. When N is limited, legumes will put on relatively more growth. In addition the use of cover crop rotations may be necessary to prevent disease problems. Continous use of lana woolypod vetch led to increased prevalence of stem and foliar pathogens. Cover crop at the site are now rotated just as the cash crop are to manage diseases. Multivariate statistical analyses are being used to evaluate a variety of plant and soil N measurement to identify the best field test for organic systems. Conventional leaf petiole and soil nitrate measurements have not proven adequate. Preliminary results indicate that total plant nitrogen levels measured early in the growing season (before first bloom) may be the best indicator of plant N nutrition and tomato yield. Potentially-mineralizable N in soil may also be a useful tool for gauging the fertility status of the soil. The SAFS project receives increased attention each year from farmers, industry, researchers, and the general public. Ideas that were once considered to be impractical or even radical are now gaining in popularity. As consumer demand for organic foods increases more growers are considering the transition to organic farming systems and seek out the SAFS project to get information and advice. Others are simply interested in reducing costs or improving soil quality. Information and experience generated by the SAFS project since 1989 is valuable in informing growers of some of the agronomic, economic, and ecological consequences of their many options.